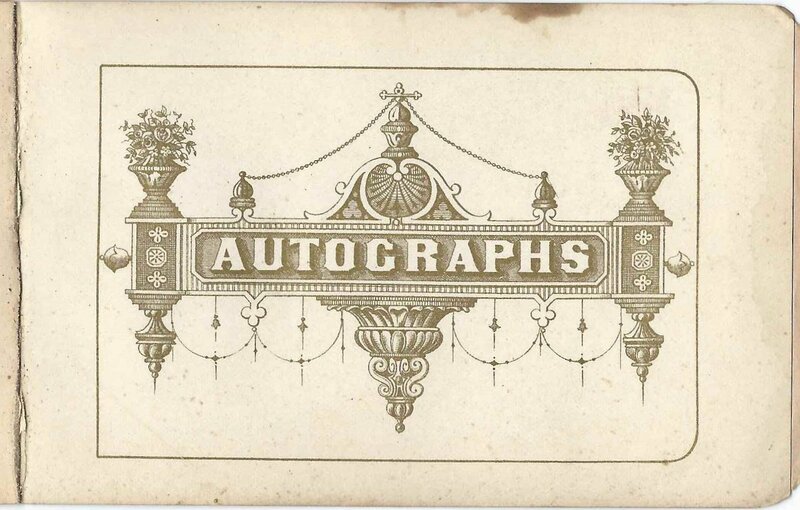 1880s autograph album that belonged to Fred Cadwell of western Massachusetts. He was born at Enfield, Massachusetts, and lived at various times at Montague, Fitchburg and Greenfield. 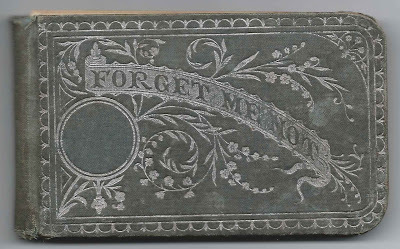 The album is approximately 5" x 3" and contains 49 pages signed by Fred himself, his relatives and friends from Massachusetts and New Hampshire. 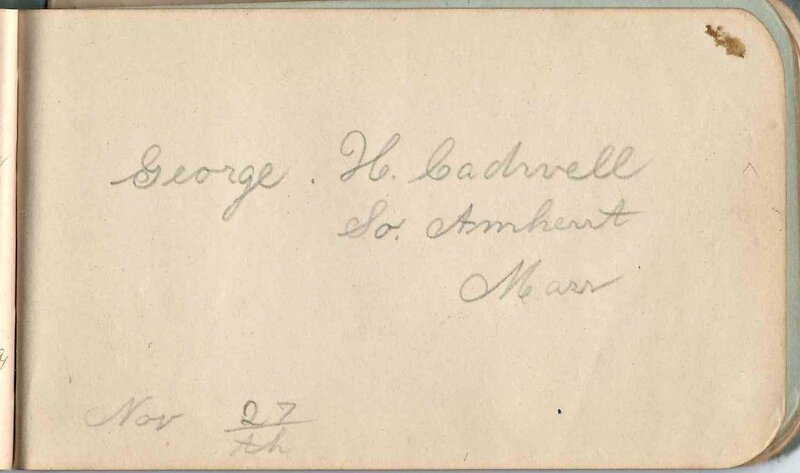 An alphabetized list of signers appears at the end of this post. Fred Erwin Cadwell was born 29 September 1869 at Enfield, Massachusetts, son of Aretas Janes Cadwell and Esther (Needham) Cadwell, who were born at Hadley, Massachusetts, and Wendell, Massachusetts, respectively. Enfield, Massachusetts, and several other towns were flooded once the construction of the Quabbin Reservoir was complete. 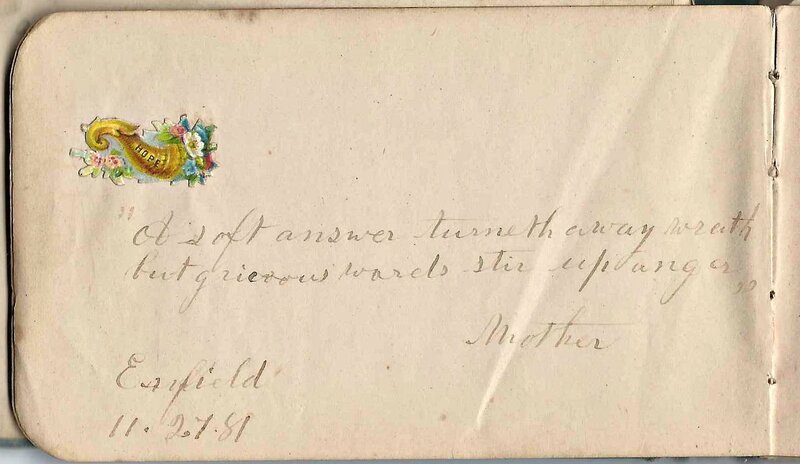 Fred's mother Esther (Needham) Cadwell of Enfield, Massachusetts, signed a page in 1881. One signer indicated that she was Fred's grandmother, age 85. 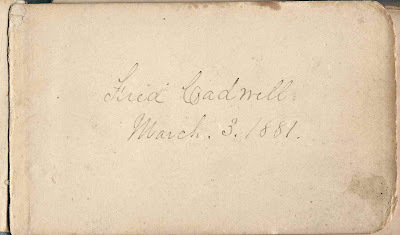 Since I found a source that gave the death year of Fred's paternal grandmother Jerusha (Warner) Cadwell as 1866, before his birth, I'm assuming that "Grandmother" was his maternal grandmother, Eliza(beth) (Howe) Needham, who lived until 1887. 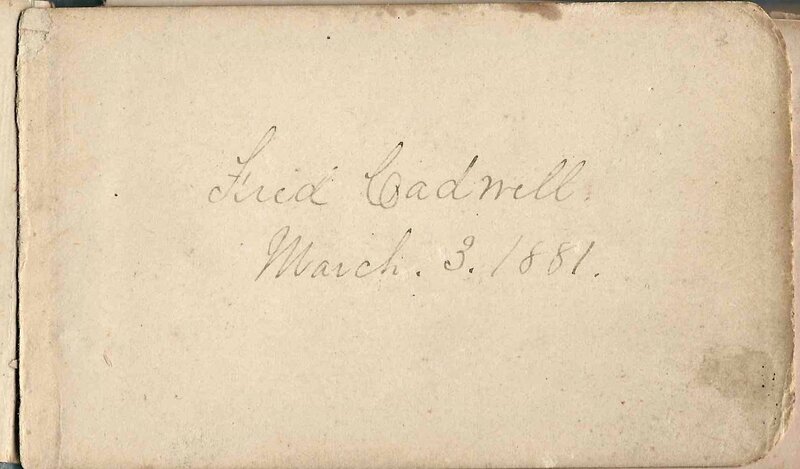 George H. Cadwell of South Amherst, Massachusetts, signed a page. He may have been the George H. Cadwell who was Fred's older brother. On 23 June 1891 at Montague, Massachusetts, Fred E. Cadwell married Eda M. Cummings, daughter, I think, of Charles and Mary E. (Hemenway) Cummings, but I'd like confirmation of that. I found her name online spelled as Commings, Cammings and Coming, as well as Cummings. 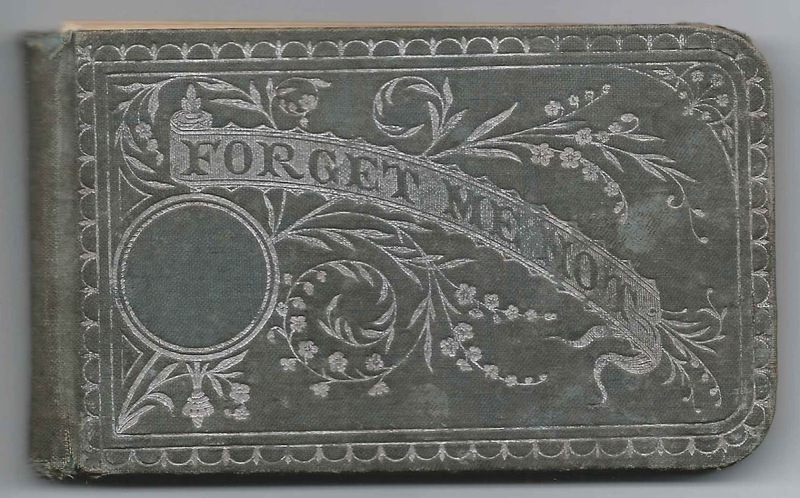 See a post on the autograph album that Eda kept while she was a student at Montague High School in the 1880s. Fred and Eda had at least one child, a daughter Helen, born 2 August 1892 at Montague, Massachusetts. In the 1900 Census, Fred's occupation was shown as working for Standard Oil Company. Later on, he became an upholsterer and mattress manufacturer. Daughter Helen married Ralph E. Wood. 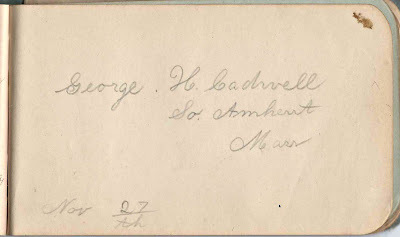 The George H. Cadwell of South Amherst, Massachusetts, who signed the page below may have been Fred's older brother George H. Cadwell. 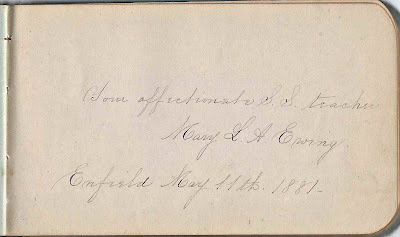 Fred's Sunday School teacher Mary L. A. Ewing of Enfield, Massachusetts, signed a page in 1881. Several other Ewing family members also signed. 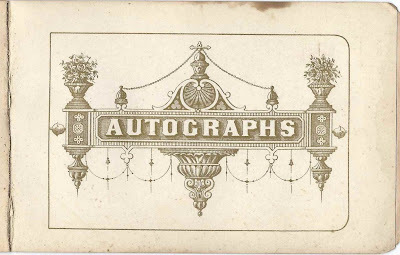 If you have corrections to the information above or insights into any of the people named above or in the list of signers below, please leave a comment or contact me directly. Thanks! 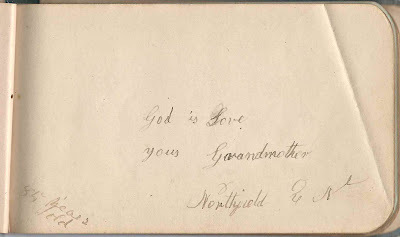 Bertha Bucklin of Lebanon, New Hampshire, 1881; refers to him as "Brother Freddie"
Grandmother of Northfield, "85 years old". 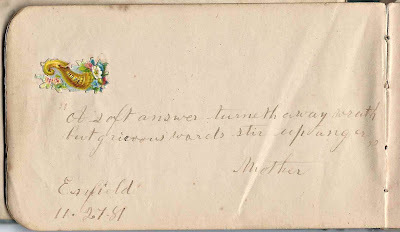 I believe Fred's paternal grandmother, Jerusha (Warner) Cadwell, had died in 1866, before Fred's birth. That leaves his maternal grandmother, Eliza (Howe) Needham, who lived until 1887, as the likely signer.